Has Social Commerce Finally Got Off the Ground? Although we’re spending huge amounts of our time on social platforms – almost surpassing the time we spend watching TV – the link between social media and online shopping is weaker than you might expect. Data from Bazaarvoice shows that only 19% of online shoppers have ever purchased from a social media platform. There are lots of reasons why we’re not buying from social media yet. For starters, the shopping experience via social platforms has historically been pretty clunky. Until very recently, it hasn’t been possible for Snapchat or Facebook users to complete what seems like the most natural journey; going directly to a product page, making a purchase and returning to their feed. Brands haven’t been sufficiently persuaded of the potential of social eCommerce to invest in it, and they’ve been unsure which platform to focus on. For example, although Snapchat offers a better social eCommerce experience, it’s a young audience with little disposable income. Many brands have focused on Facebook and Pinterest instead, where the audience is older and wealthier. Data from Kleiner Perkins show that younger adult consumers are widely using social media for product discovery. A majority of adults aged between 18 and 34 in the US were using Facebook to find new items, with Instagram and Pinterest also popular choices. Snapchat was less successful at driving discovery; only 22% of those responding to the survey said they used the platform for hunting new items. Perhaps it’s because Facebook advertising seems to have become more effective. Nanigans data shows click-through rates to eCommerce sites have risen from a mere 1% at the start of 2016 to 3%. Ad engagement on the platform is rising, perhaps because of better targeting and new ad formats. It’s worth noting that the cost-per-click has also risen, meaning advertisers are paying more for those click-throughs than they have done in the past. Only a small percentage of referrals to eCommerce sites comes from social media but there’s a healthy upwards trend. In 2015 only 2% of eCommerce site referrals came from social platforms; this year it’s more like 6%. It’s a trend that’s likely to continue if more retailers continue to invest in social media advertising and other activity. Many consumer purchase decisions are now video-enabled, thanks to increasing product conversation on video-focused social media platforms. Back in 2015, data from Google showed that 57% of consumers were using YouTube to research electronics before they purchased them. In China, a similar phenomenon sees consumers watching live stream videos on Taobao that combine product pitches and entertainment. 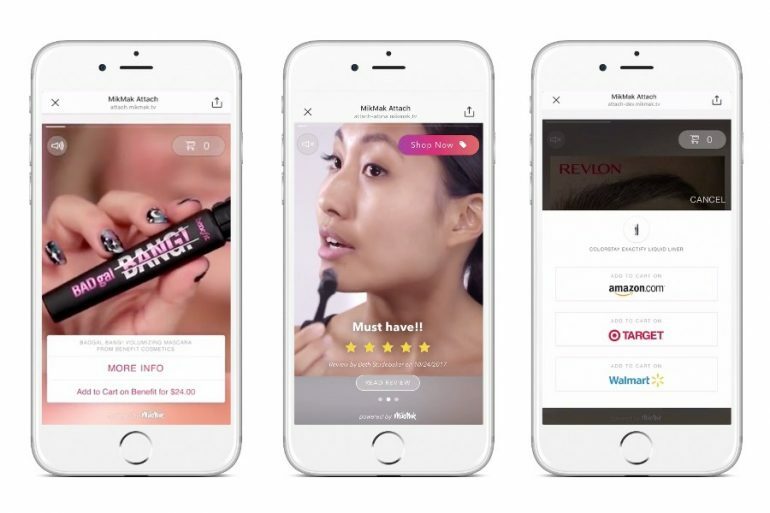 Social video commerce platform MikMak offers to let brands link “shoppable” video ads to further branded content, with the aim of creating a seamless journey between watching and buying. It’s a way to make it easier for consumers to shop without leaving the social platform they’re already on, for a smooth and uninterrupted journey. Benefit cosmetics used it to allow consumers to buy mascara from them without leaving Instagram. Other video formats on offer allow consumers to buy from their retailer of choice, so they can see a product in a video then choose whether to buy from Amazon or Target. Other MikMak formats simply drop all the products seen in a video into a customer’s shopping cart. Retailers that have experimented with MikMak’s services report higher engagement and product consideration and a decrease in drop rates. It’s these kinds of innovations that are driving social commerce forward by making an easier journey for customers and offering hassle-free integration for retailers. Social commerce has always offered the proposition of relaxing the boundaries between activities online so that shopping and socialising are no longer clearly delineated. That’s why developing trends such as gamification and group buying are also driving forward social commerce: they help blur the lines between these activities. In China, the Pinduoduo app encourages you to refer friends and create a “shopping team” in order to reduce the price of products via group buying. Pinduoduo isn’t the first to invent the concept of group buying: the model is very similar to Groupon. It’s really caught on as a concept in China, perhaps helped by the collectivist culture, WeChat integration and a range of incentives such as coupons and very good discounts. Furthermore, the app has close to 200 million monthly users, most of them women. The genius of Pinduoduo is that it attracts new users at very low-cost thanks to the member-get-member set up. Lingerie brand Victoria’s Secret has been experimenting with the gamification of shopping via a branded app called PINK Nation. Users are incentivised to download the app, and they can then not only buy products from the brand but also play games that offer prizes and rewards. It’s a way to drive engagement as well as sales. These kinds of activities help boost social commerce but they demand a long-term commitment from your brand. Social commerce is built on the premise of having ongoing relationships with your audience that are fun and friendly. For many brands, that’s a big commitment. So how seriously should your brand be taking social commerce? Although social media is only driving a small percentage of eCommerce site traffic, it’s a percentage that seems to be growing. Most importantly, it’s potentially a way to engage with the customer of the future. Young consumers are the ones driving the trend of product discovery via social media and they are the ones most retailers are keen to engage with. As social commerce starts to get off the ground, your brand should be exploring how it’s going to respond in this new area of focus.